It is a beautiful spring day! 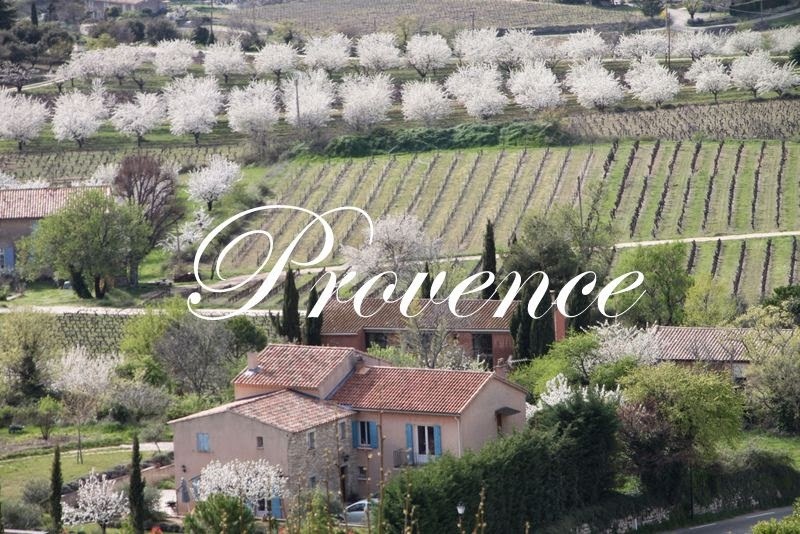 Bright sunshine, pretty blooming flowers, birds singing and moderate temperatures make us happy! 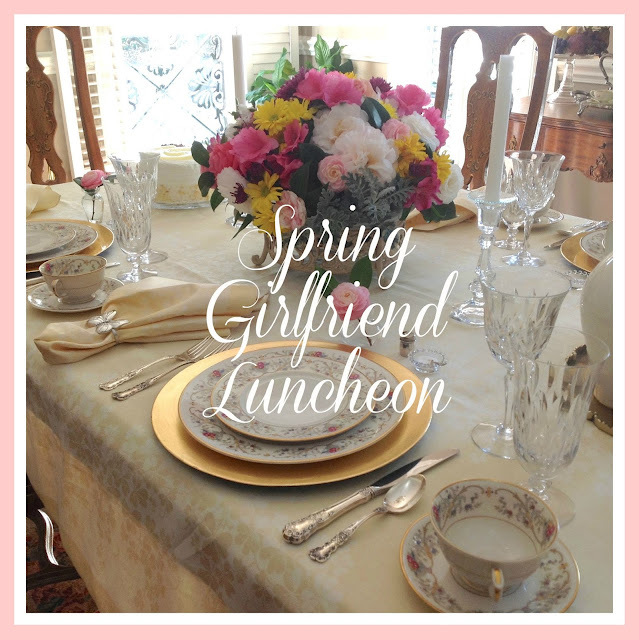 It is a perfect day for a girlfriend luncheon! I love people, beautiful flowers, pretty dishes, and great food so a spring luncheon is right up my alley. What is better than getting together with friends and eating and chatting for hours? There is always something to talk about with all my girlfriends which includes you, my blogging friends. Sit down and let's enjoy a relaxed lunch. 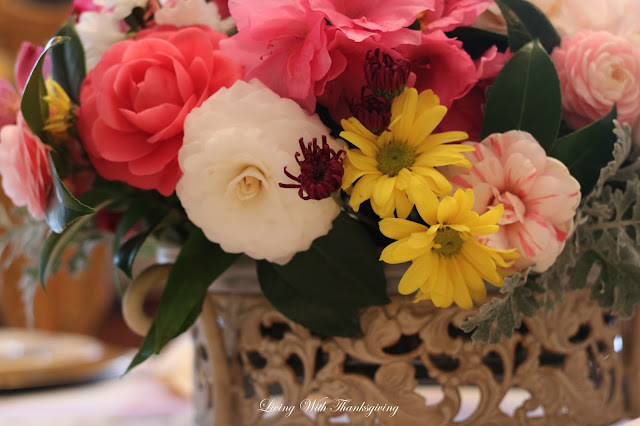 Flowers are my passion and I am happy to have fresh picked camellias and azaleas from my garden for the centerpiece. I bought one bunch of flowers from the grocery store to add some yellow to the arrangement. The footed container for the centerpiece is actually a casserole dish and caddy that was the ideal size and texture. 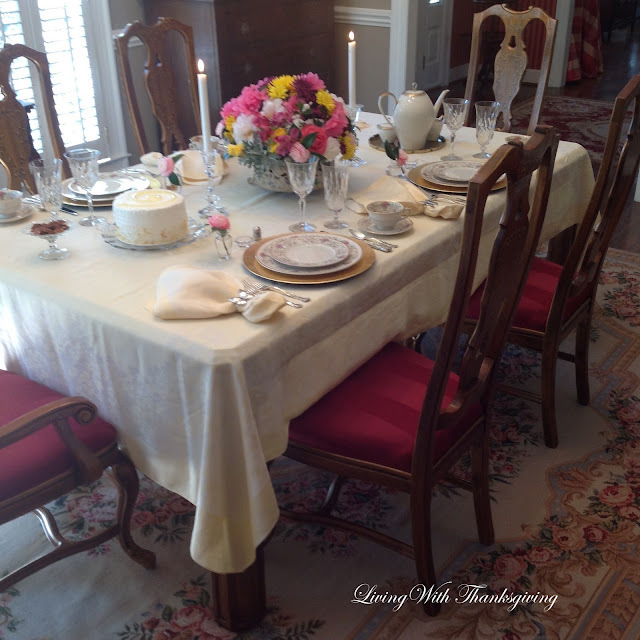 A luncheon for four in an intimate home environment with no distractions can be very relaxed. A small number of guests gives each person time to share and enjoy each other. No cell phones allowed! The delicate vases of fushia, yellow and blue flowers with scrolls of gold trim and verge is such a feminine pattern perfect for our luncheon today. The china is vintage american made from the 1930's called Lamberton Ivory in the Dorothea pattern. I set the table before I planned the menu and the dessert fork is in the wrong place. There are some other mistakes in etiquette but I'll not embarrass myself by pointing them out. This tablecloth began my color scheme for this tablescape. I love the damask shamrock design. 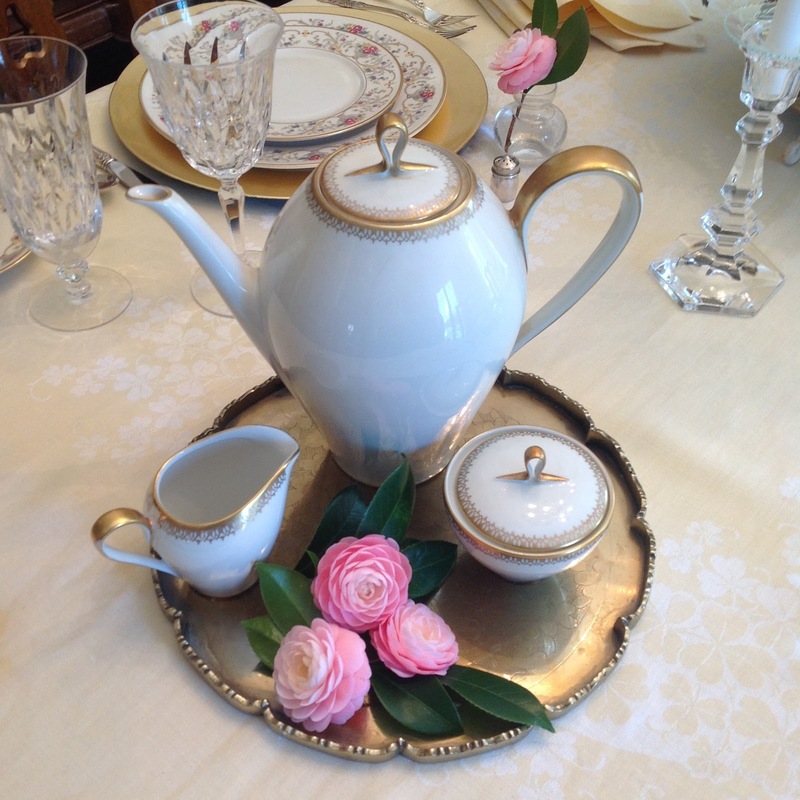 The ivory coffee set with gold trim is Eschenbach made in Bavaria. Vintage scalloped brass tray is from China. cherry tomatoes and olives, asparagus wrapped in prosciutto, and homemade yeast rolls. 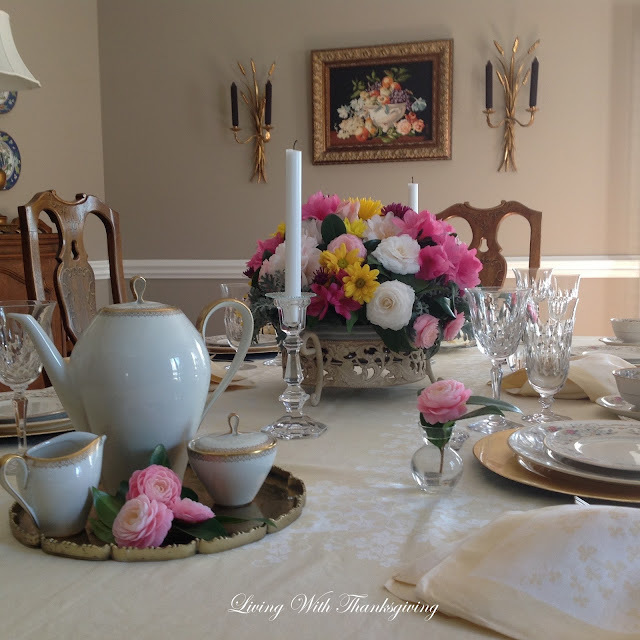 To pick up the fushia flowers in the china I added fushia azaleas in the centerpiece. Also shown above the yellow roses are my white with a slight pink tint camellia called Julia France. Dusty miller adds additional texture and repeats the white color. Each place setting has it's own pink perfection camellia blossom in a tiny vase. The individual candlewick salt cellars and salt spoons were collected over several years. Thank you for joining me today for a spring luncheon. I hope you will be inspired to host a girlfriend luncheon soon. 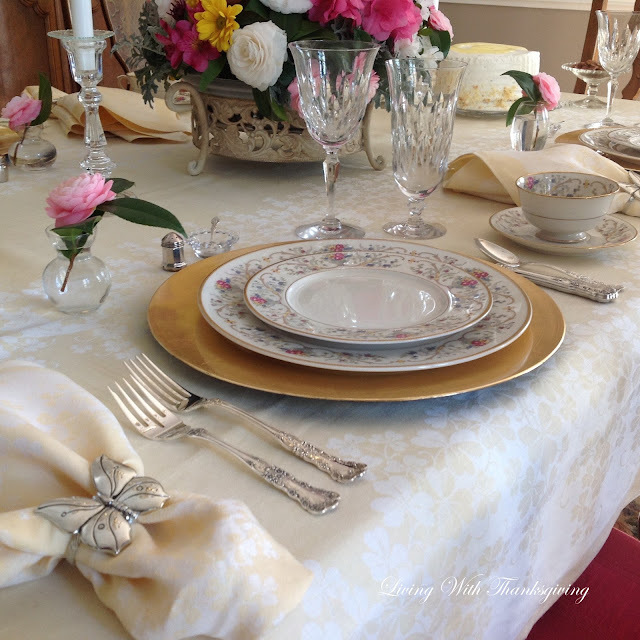 I cherish my friendships and enjoy setting a beautiful table to entertain. Please continue the bloghop with bloggers listed below. Bonnie, you are a gracious Southern hostess and any lady would be blessed to sit at your stunning table and enjoy your sweetness! First, I am swooning over the gorgeous china, it is so delicate and feminine. I love salt cellars on a table, we just don't see them often enough. Your centerpiece of camellias and azaleas is perfection with the individual vases of camellias. The table is so fabulous, I haven't mentioned the menu...orzo salad, oh my! I only wished I lived closer! Oh Bonnie, to be a guest at your pretty table would be such a treat! Your centerpiece is gorgeous, and I love your shamrock damask tablecloth. The China pattern is such a pretty vintage pattern. The menu sounded perfect for a ladies luncheon, too. I'm sure your friends had a fabulous time at your welcoming table. P. S. Will you be posting your recipes?? The shrimp orzo salad sounds yummy! That is truly lovely, the flowers and plates work so well together. Your menu sounds delicious! What a gorgeous table Bonnie, Everything is so elegant. I noticed that you used individual salt cellars. I do too! I love the special tough they bring. Beautiful flowers. 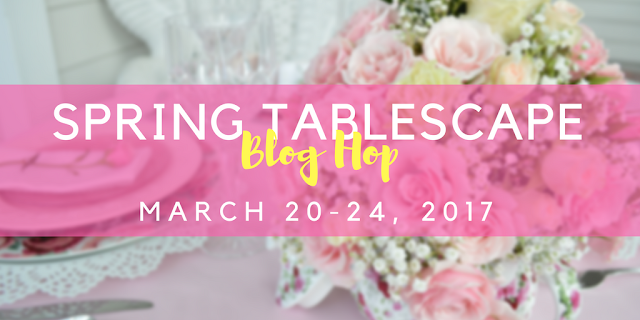 Thanks for sharing on the spring blog hop. Stopping by from the blog hop. Thank you for sharing your beautiful table. Your table is so beautiful, Bonnie. I love how you tied the china pinks with the flowers! What a gorgeous table, Bonnie! Your china is so pretty, and I am swooning over that beautiful tea set. You did such a wonderful job on your lovely floral centerpiece. It looks perfect on your table, and that cake looks most delicious!!! 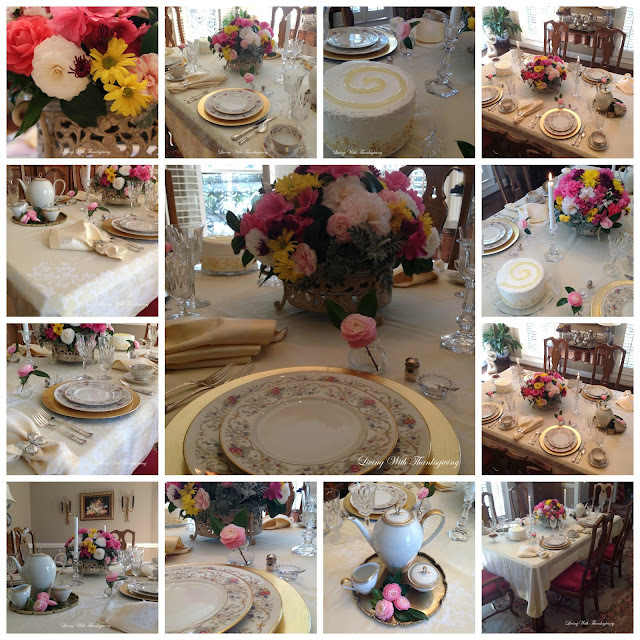 I love your beautiful Spring Tablescape! The china is stunning and I fell in love with the butterfly napkins rings! Hi Bonnie, such a beautiful table for your girlfriends. I wish I lived close by. You have the prettiest china and those flowers are gorgeous. A beautiful tea set to enjoy as well. Everything looks so elegant and that Lemon creme cake is a lovely addition. Happy Spring. Shat a beautiful table!!!!! Perfect for a girls lunch! I love your vintage china! So beautiful! 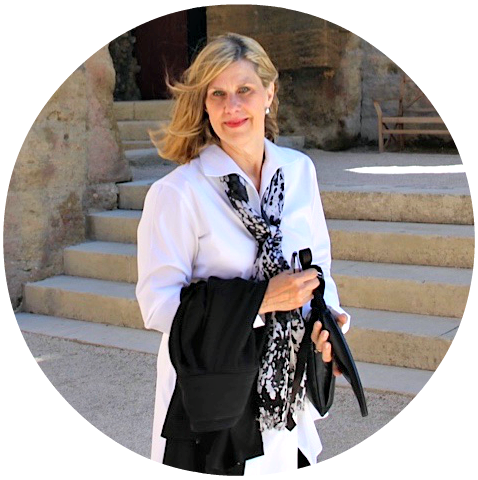 Bonnie, there is just something very calming each and every time I visit your blog that my soul craves. It's a beautiful table setting, and I love your collection of the tiny Candlewick salt cellars and spoons. Never mind any oversights, it's beautiful and thoughtful to me. I would love being your guest. No cell phone! Camellias and azaleas are blooming in our yard as well! Love them in the centerpiece and love this table! What a pretty table! 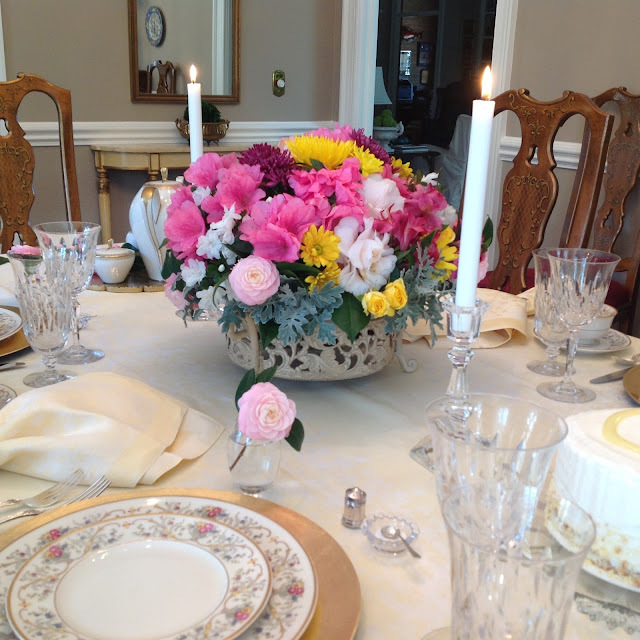 I love your centerpiece and how you carried the flowers out to each place setting too. Your menu sounds delicious! Your flowers are stunning! I wish I had a garden that could bloom like that. Wow! Those camellias have given me a shock of inspiration for sure. 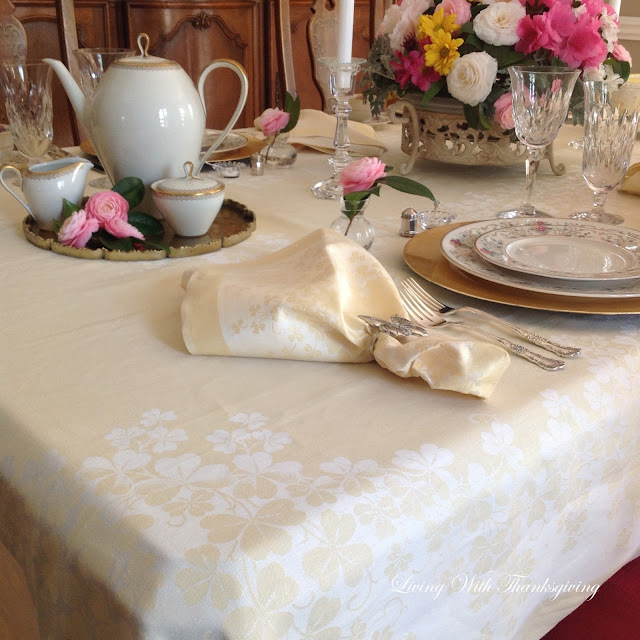 That gorgeous tablecloth is the perfect background for your lovely tablescape. 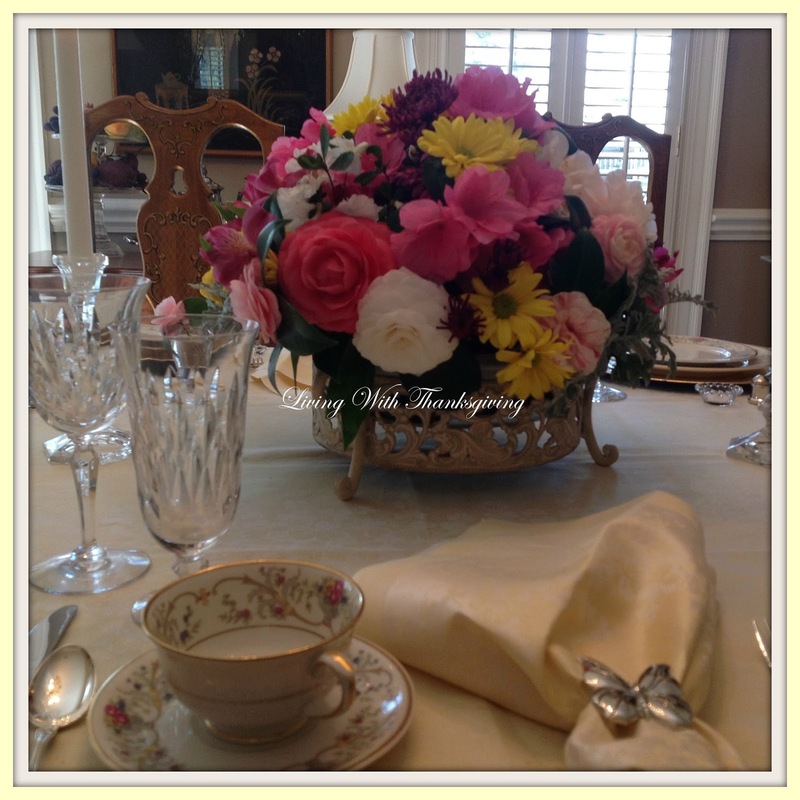 The floral centerpiece is so striking and the individual blossoms at each place setting create such a welcoming touch. Pretty dishes and stemware too. Happy Spring! This is such an elegant and refine table. Mr. Carson (Downton Abbey) would be very proud. The damask tablecloth sets the scene for your gorgeous china. And I am crushing over your stunning silver flatware. 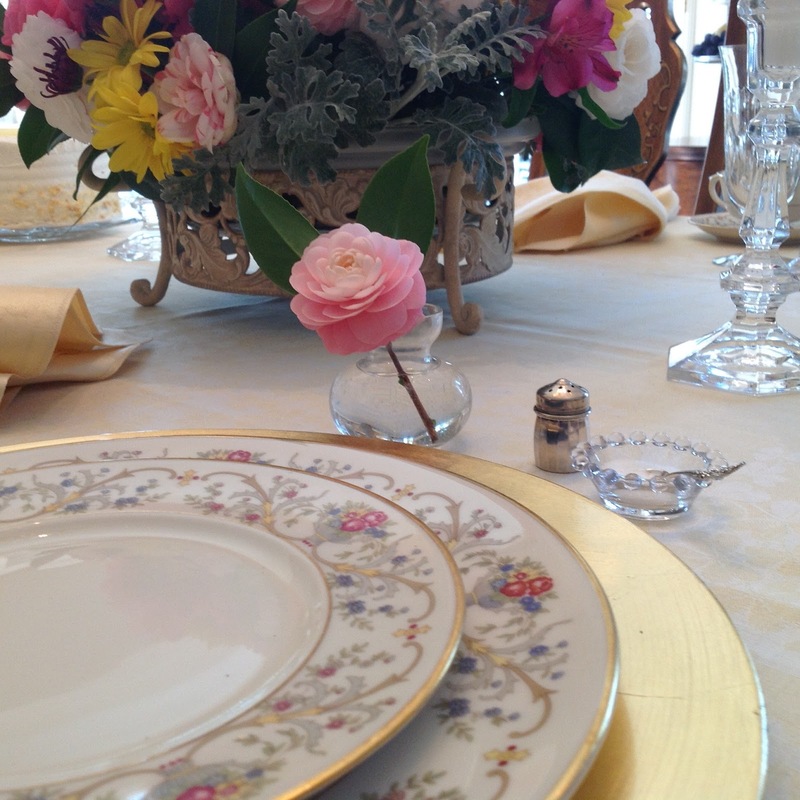 I also love how the floral arrangement picks up the pretty pink tones f your china. What an honor to be a guest at such a magnificent table. I enjoyed the elegance of your table very much. 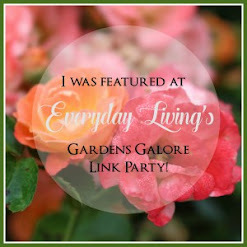 Looking forward to this blog hop. So nice of you to invite all of us for a delicious meal around this beautiful table. It's so pretty and the menu sounds great! I would love to have lunch at your home! Feel like a queen eating there.Beautiful tablesetting. 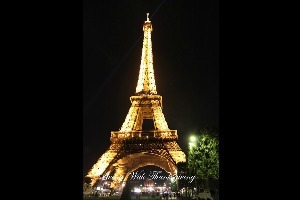 This is just pure loveliness and how I would love to have been there to enjoy it with you. The table setting is beautiful! Thanks for sharing! Wish I had been one of the girlfriends! Such a lovely table Bonnie. Your flower centerpiece is even more special since it comes from your gardens. I've never seen the tablecloth pattern before and I love the shamrock, just gorgeous. All the extra touches makes your luncheon special. I'm sure your guests enjoyed this spring day in your home. 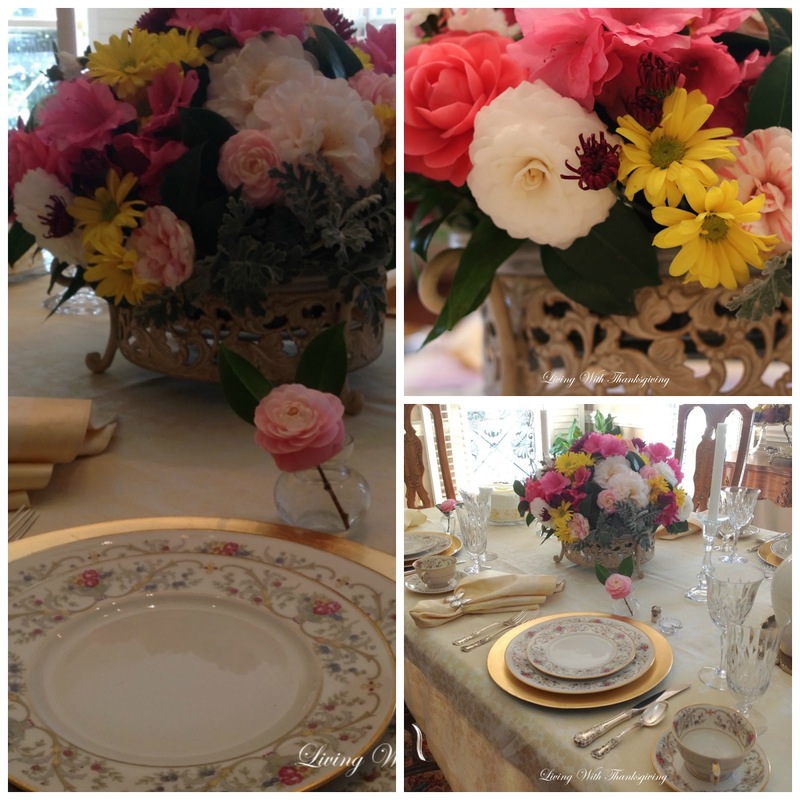 Such a beautiful table, perfect for luncheon for ladies! I love all of the delicate touches, such as the pattern on the china and the perfect little camellia blossoms. The individual salt cellars are a perfect touch. I love the opportunity to host a ladies luncheon and I would enjoy being invited to your lovely table. 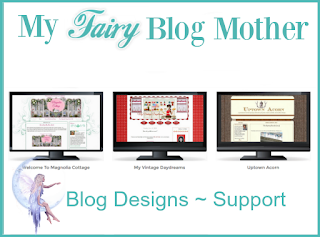 Thank you so much for being a part of the blog hop! 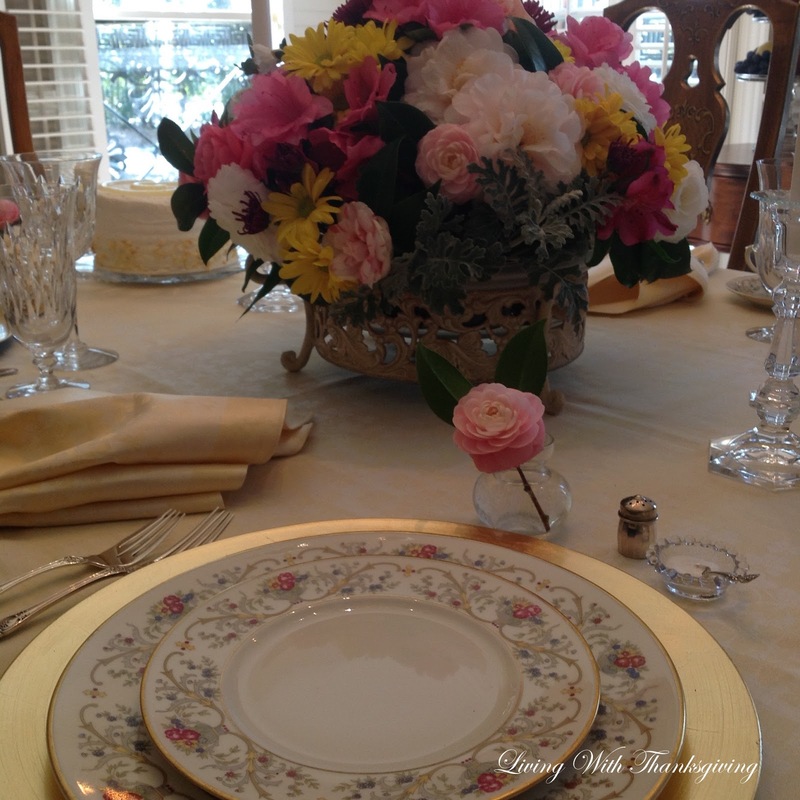 This is such a beautiful table setting Bonnie and naturally your flowers are the icing on the cake! What a joy it was for your friends to be treated to such a lovely and hospitable afternoon! A perfect table for a gathering of girlfriends as it is very feminine, full of color both soft and bright. I can imagine than reflecting the personalities of the gals lucky enough to join you. Your table is so beautifully set and with that luncheon menu I'm sure your friends enjoyed the day. Everything is so classic and elegant. So beautiful. Love the centerpiece! Bonnie, I couldn't agree more about entertaining girlfriends for lunch in one's home. It's fun to go out, but something about being in the privacy of one's home is much more special. I know your friends felt the intimate charm of this setting. Your table setting with the gorgeous details is stunning. Obviously you have a talent for entertaining. Thanks for sharing. What a wonderful luncheon! The table is beautiful and the menu sounds delicious. I love Camellias! I visited the Caolinas last spring for the 2nd time and enjoyed all the beautiful blooms. Placing one by each table is perfect! What a lovely tablescape! Love the fresh flowers and how wonderful to have them in your own yard! I will use anything from my yard as it truly brings beauty indoors! Thanks for sharing your ideas for a perfect lunch setting! Your table is gorgeous! I'm sure you all had a delightful visit. 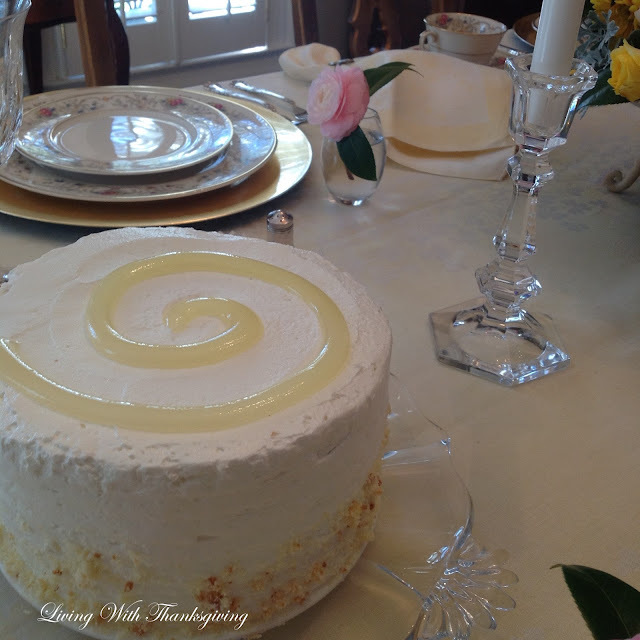 The Lemon creme cake looks the the perfect ending to a wonderful lunch. Crystal and flowers! What a wonderful way to ring in Spring. I enjoyed the written details and your humor in not pointing out whatever detail you spotted. Have a lovely day. 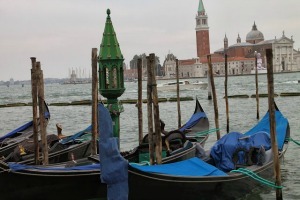 It was so nice to see this again and to blog hop with you this week. Thank you for sharing with us this week at Celebrate Your Story, and I hope you’re having a great weekend. You have such beautiful dishes! Your floral centerpiece is amazing and looks great in that casserole stand. What a beautiful place for lunch with friends. Such a pretty table and the menu sounds yummy! I'm sure everyone had a lovely time. If you're gonna lunch, you may as well lunch in style. And that cake! Wow! Well Bonnie, I FINALLY got over to your blog to catch up! I feel like I've been a terrible blog friend lately, but we've had so much going on. I have to tell you I'm in love with this tablescape -- it is truly gorgeous. You are so good at flower arranging and setting a pretty table, and you have such lovely things to share. I, too, love that damask shamrock tablecloth and looks like matching napkins (?) Anyway, your centerpiece is stunning; I forget just how pretty camellias can be. Those dishes are some of the prettiest I've seen -- so glad you showed them and shared the pattern name. Your girlfriends are really lucky to be treated to such a special table and meal. Excited winner of two giveaways! 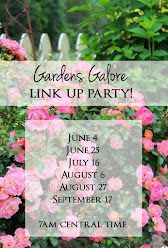 You are invited to a blog hop next week.